Wondrous spring splash! Meet 200+ new ladies! International Women’s Day! It’s Time To Celebrate! Catholic world celebrated Easter on April’5 this year. In Russia, Belarus and Ukraine Easter will be celebrated on April’12. Easter is the best reason to congratulate the person you like and to come into her life with wonderful surprises and gifts! 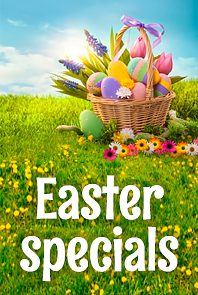 We invite you to check our special propositions for Easter deliveries. We congratulate on this wonderful holiday all our customers and wish you Happy Easter! We hope Easter 2015 will be filled with dear traditions and new memories for you! Let this Easter renew your faith, cheer up your spirit and fills your heart with joy!